Dhanvantaram tailam is one of the best ayurvedic massage oils with non-specific uses. It is suitable for all types of constitutions. Dhanvantaram tailam is helpful in many rheumatic and neurological diseases, relieves tiredness and muscle tension. This oil prevents bone and teeth diseases as well. One of its main advantages is that it supports woman organism during pregnancy and in the postpartum period. 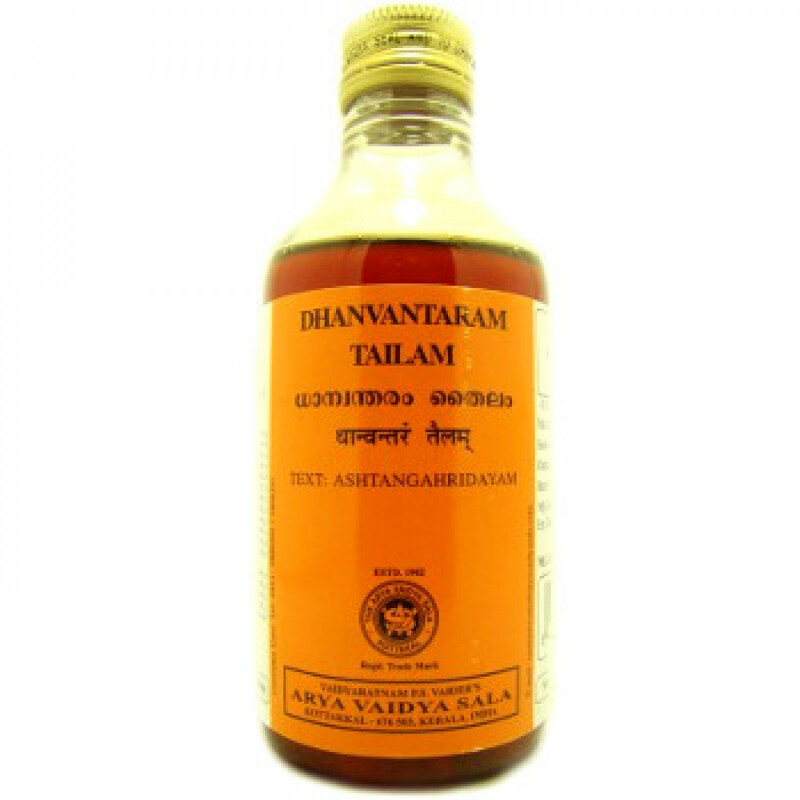 Dhanvantaram tailam has a rejuvenating and antioxidant properties, boosts immunity. Dhanvantaram tailam has a very pleasant scent and it is a good cosmetic item for face and body. Its ingredients stimulate skin purification and blood circulation, thus skin attains healthy and beautiful look. it is a perfect cosmetic remedy for face and body. Content: Balamoola – Sida cordifolia, Paya – cow milk, Yava – Hordeum vulgare, Kola – Zyziphus jujuba, Kulattha – Dolichos biflorus, Dashamoola, Bilva – Aegle marmelos, Agnimantha – Premna mucronata, Shyonaka – Oroxylum indicum, Patala – Stereospermum suaveolens, Gambhari – Gmelina arborea, Brihati – Solanum indicum, Kantakari – Solanum xanthocarpum, Gokshura – Tribulus terrestris, Shalaparni – Desmodium gangeticum, Prishnaparni – Uraria picta, Taila – Sesamum indicum, Meda – Polygonatum cirrhifolium, Mahameda – Polygonatum verticillatum, Daru – Cedrus deodara, Manjishta – Rubia cordifolia, Kakoli – Fritillaria roylei, Ksheerakakoli – Lilium polyphyllum, Chandana – Pterocarpus santalinus, Sariva – Hemidesmus indicus, Kushta – Saussurea lappa, Tagara – Valeriana wallichi, Jeevaka – Malaxis acuminata, Rishabhaka – Manilkara hexandra, Saindhava Lavana – Rock salt, Kalanusari – Valeriana wallichi, Shaileya – Convolvulus pluricaulis, Vacha – Acorus calamus, Agaru – Aquilaria agallocha, Punarnava – Boerhaavia diffusa, Ashwagandha – Withania somnifera, Shatavari – Asparagus racemosus, Ksheerashukla – Ipomoea mauritiana, Yashti – Licorice – Glycyrrhiza glabra, Haritaki – Terminalia chebula, Vibhitaki – Terminalia bellirica, Amla – Emblica officinalis, Shatahva – Asparagus, Mashaparni – Teramnus labialis, Mudgaparni – Phaseolus trilobus, Ela – Cardamom – Elettaria cardamomum, Twak – Cinnamon – Cinnamomum camphora, Patra – Cinnamomum tamala. Usage: Oil must be heated before application. It can be used for head massage as well. After massage keep oil 20-30 minutes on the body, then wash with warm water. Note! In muscle pains and diseases of joints Mahanarayan tail is more preferable.